Summary: This is the part 2 of a duology. It is the sequel to Six of Crows. (Go here to see my review of that one.) This review will contain spoilers for the first book. Kaz and his crew barely made it out of the Ice Court alive with their target, and now they've been double-crossed by Jan Van Eck, the most powerful merchant in Ketterdam. AND he's got Inej. AND his son is stuck with his face altered to look like the boy they broke out of Fjerda. AND Nina is fighting a jurda parem addiction. Schemes, tricks, and friends old and new come together as Kaz prepares perhaps the biggest con of all, to get the money they are owed, to get revenge on one of the other Barrel bosses, and to take down the corrupt Van Eck. But as they double-down on their bets and enemies old and new show up, they start to realize how much they stand to lose - not just money, reputation, or their own lives, but each other. Thoughts: My favorite witty lady Jane Austen once wrote, "If a book is well written, I always find it too short." This is precisely how I feel about this duology, in the sense that I wish it were more than just a duology. Like a grisha strung out on parem, I NEED MORE. I need more adventures, more heists, more of my precious cinnamon roll crew of outcast thieves, murderers, and magic wielders. It was so good. SO GOOD. As I've said before, this story reminds me a lot of Leverage, one of my favorite tv shows, in that it's a crew of "bad guys" (criminals) running cons on even worse bad guys (the rich powerful people who think they can do whatever they want). I love complex heroes. I love twisty plotlines that can fool me. And I definitely love YA fantasy. One of my favorite things about this series is the characters' backstories. Each member of the crew has an incredibly rich backstory, and you definitely get more of that in this book, especially Wylan's. You really start to root for these kids because each and every one of them has been through a horrific amount of trauma or has lived in fear or has suffered loss in their young lives. Reading this, I could easily imagine this as a crew of 20-somethings, which would be fine, but when I remind myself that these are teens - kids who have been kidnapped and sold into prostitution, kids who have lived in abject poverty and had to learn to kill or be killed, kids who have been stripped of a loving and innocent childhood - it makes the stories that much more powerful. You really see how strong they are. In addition, this has got to be one of the most diverse cast of characters I've ever seen. Nina is a larger, curvy girl. Inej is Suli, which I visually identify with South Asian features. Jesper is half-Zemeni, which I visually identify with black features. He's also a queer character, as is Wylan (minor spoiler there). Wylan has some sort of learning disability, but he's a genius at music and chemistry. Kaz has a physical disability. Even Kuwei, who is not necessarily a crew member, but still important, is Shu, which I visually identify with East Asian features, but their eyes are gold-colored, which is SO COOL. 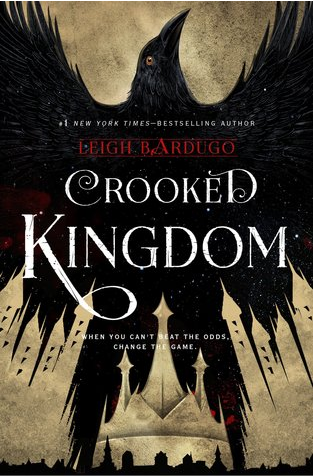 I mean, can we stop for a sec and give Leigh Bardugo a resounding standing ovation for this diversity? I wish more white authors, especially in YA fantasy/scifi, could learn from her example. And each and every one of them has a fascinating, complex backstory that makes them a whole, multi-faceted human being and not just a flat stereotype. Many authors can't manage that level of complexity with just one character, let alone a crew of SIX. Even Matthias, who is the one straight-up "status quo" character (cishet able-bodied white male), has a full and interesting character arc. But a book can't stand on backstory alone - it needs story-story. And this story had all the twists and turns of Six of Crows but cranked up to 11. I have to admit, I took longer than usual to read this book, and it's because I was dreading the next bend in the river. We would get to a point where the crew is all together, and they're basically fine and well, and I would look to see how much of the book I had left, and I would think, "Oh man. This isn't going to last. Something awful is going to happen." And true to form, awful things DO happen. And then we rack our brains trying to figure out which awful things were part of Kaz's genius plans and which awful things were really happening to our favorite criminal crew. One last epic con. With some epic FEELS and some epic heartbreak thrown in for good measure. It was everything I wanted... except that I want more. I have grown to care about these kids, and I want to know what happens to them after. These two books... they're just not enough. I do want to discuss one spoilery thing, so if you haven't read the book and don't want to be spoiled, then STOP HERE. GO READ THE BOOK. Okay, can we talk about Matthias' death for a sec? I was NOT expecting it to really happen. I kept waiting for some sort of miraculous save and IT DID NOT HAPPEN. Why? WHY did he have to die? He and Nina were supposed to grow old together and have babies and wolf cubs!!! Seriously, we came SO far together on this journey. They survived some of the unlikeliest situations I have ever seen. All for Matthias to be shot in the gut by some druskelle recruit who's only been in training for 6 months? That's it? That's the end of Matthias? Not even a blaze of glory for our stubborn surly Fjerdan??? Just some brainwashed brat with a gun?? And the rest of the crew never even finds out how it happened, huh? Ugh!!! Me too! I kept waiting for something to happen, it just seemed too wasteful for him to die so easily. I mean, I understand that he was trying to talk sense into the small boy, but come ON!!! A friend and I were discussing what happened and she mentioned that it was upsetting because if Nina had her regular Grisha powers she may have been able to save him, instead she was forced to watch him die. Yeah, I just didn't get the point of why he died. It seemed senseless to me. He didn't die in any of the MANY huge life-threatening situations that they encountered - he died after the fact, by some random kid. Like, WHY, LEIGH, WHY??? It didn't have to happen!! !